ClusterOne serves large enterprise customers and is relied upon by researchers to build the next AI breakthrough for a variety of industries including life sciences and robotics. Our products solve various aspects of managing the training and deploying large-scale Machine Learning models, requiring the handling of thousands of servers, petabytes of data on various clouds, and data centers securely and efficiently. 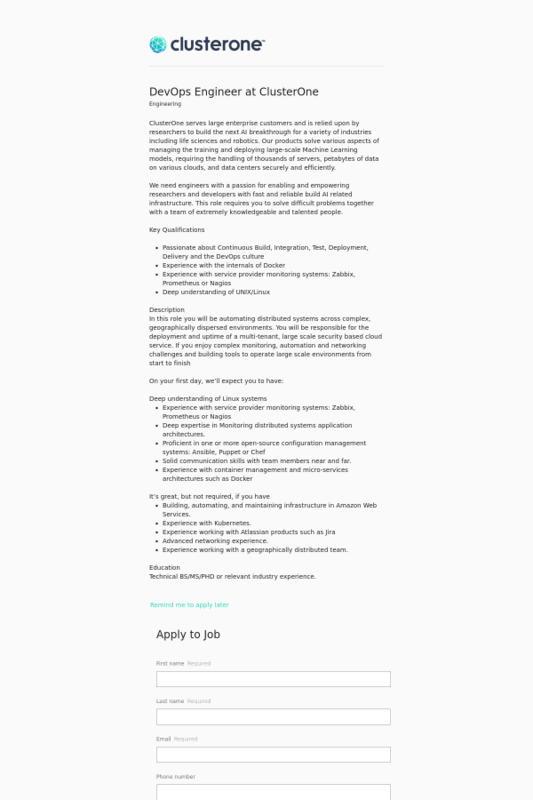 We need engineers with a passion for enabling and empowering researchers and developers with fast and reliable build AI related infrastructure. This role requires you to solve difficult problems together with a team of extremely knowledgeable and talented people. Deep expertise in Monitoring distributed systems application architectures. Solid communication skills with team members near and far. Building, automating, and maintaining infrastructure in Amazon Web Services. Experience working with a geographically distributed team. Technical BS/MS/PHD or relevant industry experience.